I baked these delicious (and dare I say moist) blueberry muffins using Kodiak Cakes Buttermilk and Honey Flapjack and Waffle mix. 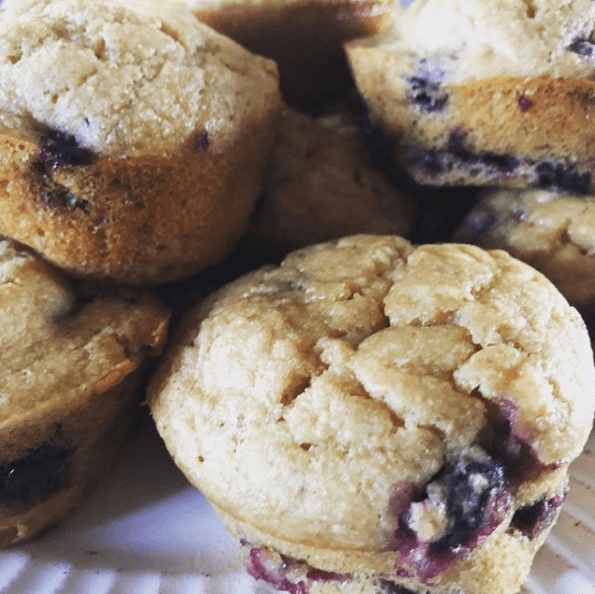 They’re also nutritious with 6 grams of protein and 2 grams of fiber per muffin. Since they’re only 132 calories per muffin, I allow myself to eat two at a sitting. In addition to being healthy and yummy, they’re easy to make. Mix these ingredients any which way you please. Again, these are easy. That’s part of the glory of baking from a box, right? Though, I do not use the box recipe. 6 fluid ounce blueberries (have you noticed the sales on fresh berries lately? If they’re not on sale where you are or you’re reading this in a different season, buy frozen). Unsweetened Coconut Milk is only 45 calories a cup and has less than 1 gram of sugar per cup. If you’re wanting more of a protein boost, or you don’t like stocking multiple types of milk in your house, regular milk works great. Kodiak Cakes brand of mix does cost more than the basic pancake mix. Why spend more? Nutrition. Sometimes spending more in the grocery store means better health and lower hospital bills. Sometimes it doesn’t. The more I learn about food and nutrition, the more time I spend looking at labels. The ingredients in the mix I used: 100% whole grain wheat flour, 100% whole grain oat flour, buttermilk powder, dried honey, egg whites, leavening, wheat protein isolate, sea salt, natural vanilla flavor. Giving this recipe a try? Share your results by tagging @40FitNStylish on Instagram. Want another recipe using Kodiak Cakes? Click here.